On the 73rd Army Day, the Military Institution remains the impregnable fortress of a sovereign nation that is forever entrenched in its surrounding region and in the world. The Lebanese people have for long resorted to this Institution in search of a strong and sound nation where valiant men stood to defend the borders fearlessly. The sacrifices of this institution make an ever-flowing river that our country depends on to overcome the ever-growing difficulties and to vanquish the grave dangers of confronting the Israeli enemy and eradicating the threat of terrorism altogether. Today, as the officers of “Dawn of the Outskirts” are leaving the Military Academy to be deployed in all the corners of the nation, the Military Institution continues to gather the values of patriotic affiliation. 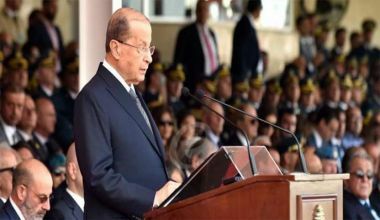 It persists in being steadfast in the belief in Lebanon just as the Lebanese remain strongly attached to this institution that is distinguished thanks to its achievements in terms of promoting solidarity and concurrence. Based on the doctrine of relying on its own resources and capabilities, the Military Institution sends a message of pride in the feats that it achieved no matter how important these achievements may be. While giving sacrifices for Lebanon time and time again in the peak of challenges, the troops devote themselves as officers and soldiers to safeguard our land. They push Lebanon and the Lebanese people forward in vanquishing all parties lurking in the shadows to do us harm and thus the troops have proven their loyalty to the country of diversity and uniqueness. The sense of courage that fills every individual who chose to enlist in this patriotic institution sets an example that many look up to. The sacrifices and the blood offered by this institution make an inexhaustible resource that we may depend on to reach unifying patriotic achievements. The Lebanese Army never prides itself of anything but the feats achieved for the sake of Lebanon where it mastered the art of challenge in a way that made it deserve all the appreciation and acclaims. The bearer of the “honor, sacrifice and loyalty” message is responsible for a pure and eternal mission that is being transferred from one generation to the other on the journey leading toward honor. The Lebanese people join me in expressing our confidence in the fact that amassing the achievements of the Military Institution’s heritage make for abundant sacrifices that will bloom in the form of strength that we may resort to in order to strengthen Lebanon’s identity and stature.